Create a comfortable and inviting living room or family room with this sectional sofa. 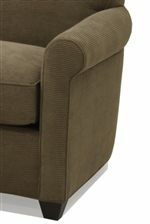 This L-shape configuration offers spacious seating for the whole family, with tight attached back cushions, and supportive welted seat cushions. Slim rolled arms frame the ends for a well tailored style. 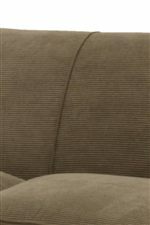 Classic and comfortable, this high quality upholstered sectional sofa is made in America. The 0491 Transitional L-Shaped Sectional with Right Chaise by McCreary Modern at AHFA in the area. Product availability may vary. Contact us for the most current availability on this product. 0491-CRB RAF Chaise 1 37" 66" 35"
0491-PLB LAF Apartment Sofa 1 67" 37" 35"